How much of the above did you achieve, on reflection? 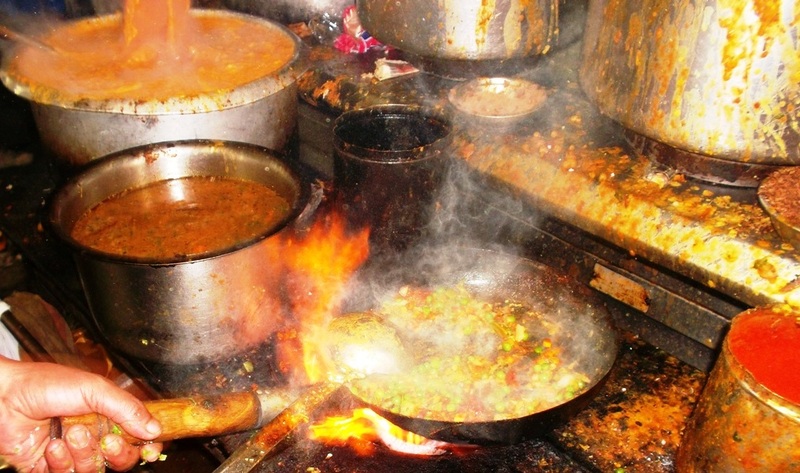 Are you cooking local Indian curries? I want to try and learn about local cuisine. 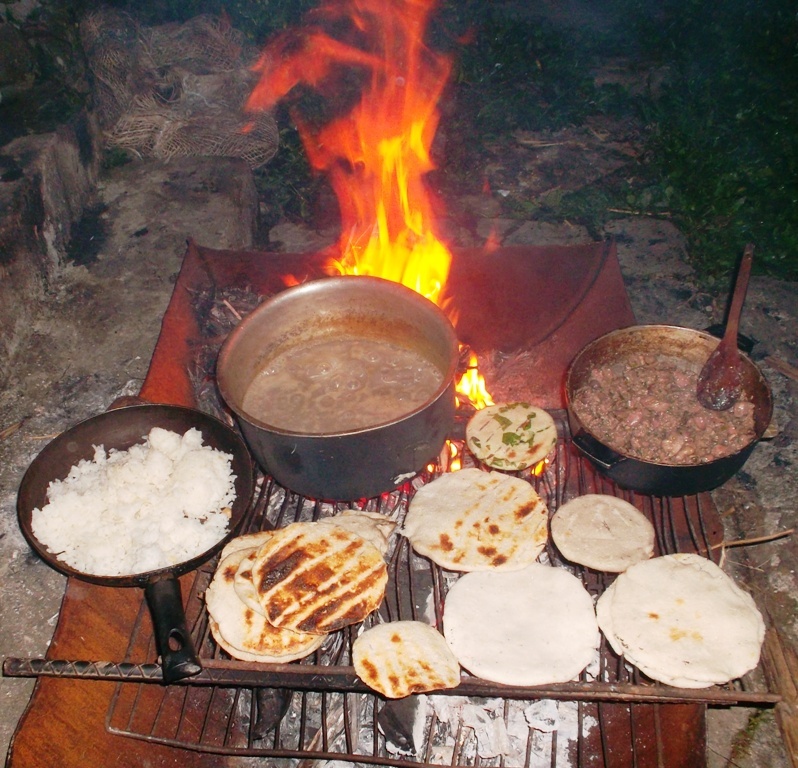 I want to learn how to cook local cuisine that I really like. I’ve learned that Indian cuisine uses an array of spices and varies greatly from region to region. 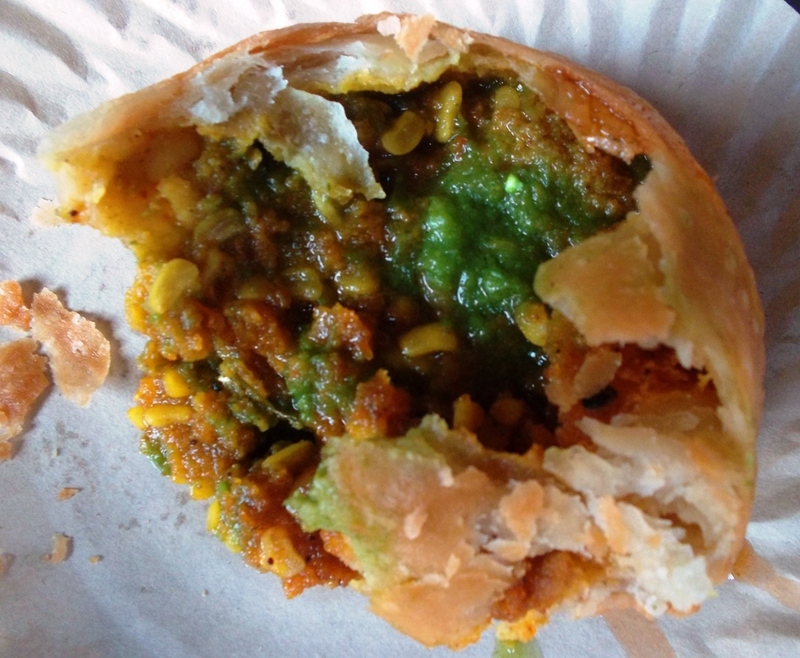 It’s not uncommon for an Indian dish to combine 15 flavors on your tongue at the same time. I never took the initiative to sign up for a cooking class in India, nor did I learn how to cook proper Indian food. I still find Indian food preparation complex. I ate a lot of street and restaurant fare, and more often than not, really enjoyed the multitude of flavors that crashed together throughout my palate. I stumbled across this delicious Cachori in Udaipur. Like all of South and SE Asia, India is paradise for the food aficionado. I empirically discovered that India might be the best and easiest place on earth for sticking to a plant based diet. I like the fact that many people on the subcontinent don’t eat meat, and that flesh food is illegal in some cities. Indian food philosophy has helped me get closer to completely eliminating land flesh consumption. I’ve adapted at least 95% of a vegetarian diet. For the moment, that suits my personal food religion. 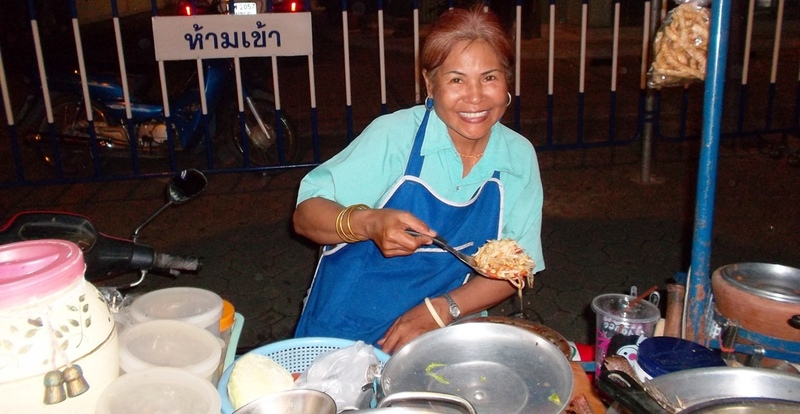 In Bangkok and Chiang Mai I went on dreamlike street feeding frenzies. The outdoor cuisine in these two Thai cities seemed super safe to eat. This photo comes from the Sunday Market in Chiang Mai, where I couldn’t stop sampling everything that I saw. 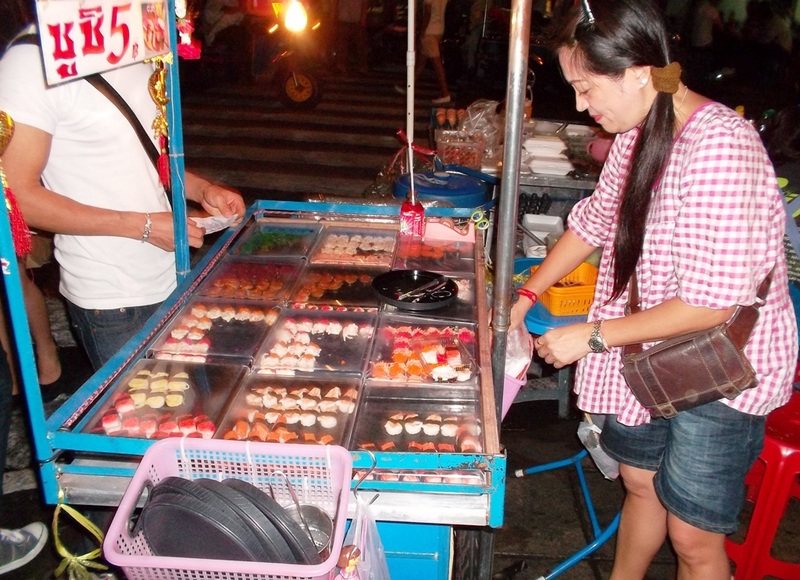 This Bangkok woman prepares sushi in her home and sells it on the street for 5 baht or $.16. She was delighted when I told her how happy I was to come across her stand. She was also content that I bought and devoured 24 pieces. I went to the island of Koh Chang. 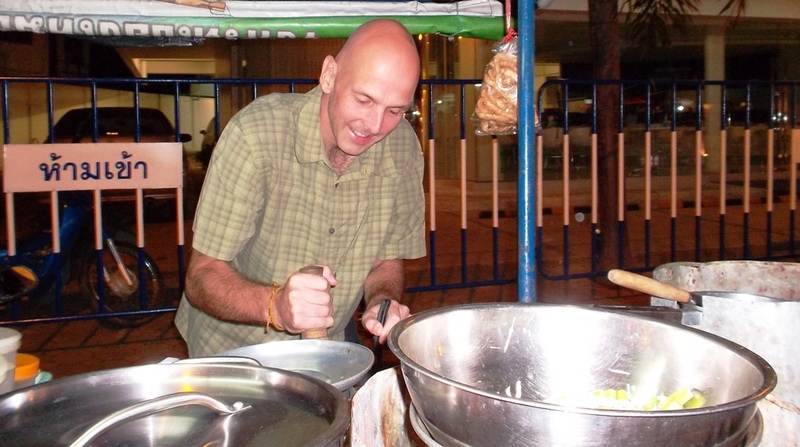 There I forgot that street food can make foreigners ill in the midsection. I ate some fish and som tam. The next day was the start of an intestinal issue that lingered and didn’t improve. I think that the fish may have had an organism that got inside of me. The hardest thing to handle wasn’t the physical sickness. The most difficult thing was looking at the attractive Cambodian food while not being able to indulge. I’d often think: I’m in a brand new SE Asian land and I can’t enjoy all of this tropical foodstuff that would fully titillate my taste buds. I tried a moon cake in Phnom Penh. I took two rich, sweet bites and thought: Now I finally understand why the Chinese and Indochinese all seem to love moon cakes. When you eat them fresh, many flavors melt together in your mouth. Unfortunately, two hearty bites heavily satiated me for the next 24 hours. I also thought: Why did I travel from Bangkok to Ko Chang? Why didn’t I go directly to Siem Reap or Phnom Penh? Hindsight is 20/20. I was eating almost anything and everything I came across that wasn’t BBQ’d flesh on a stick. That includes fish and seafood and raw salads. Something would have gotten me eventually. From that experience, I acquired a wealth of food safety awareness. NOTE: People who’d seen the weight I’d dropped automatically assumed that eating in India is what killed my appetite and caused me to lose around 25 pounds or 11 kilograms. In India, you can often watch people cooking your food over high flames. You’re not going to get sick from that. NOTE: The cooks are often super friendly and seem honored that you want to snap photos of their culinary art. A method that stands the test of time. I love all kinds of Indian bread forms. This was one of the tastiest pieces of bread I had. 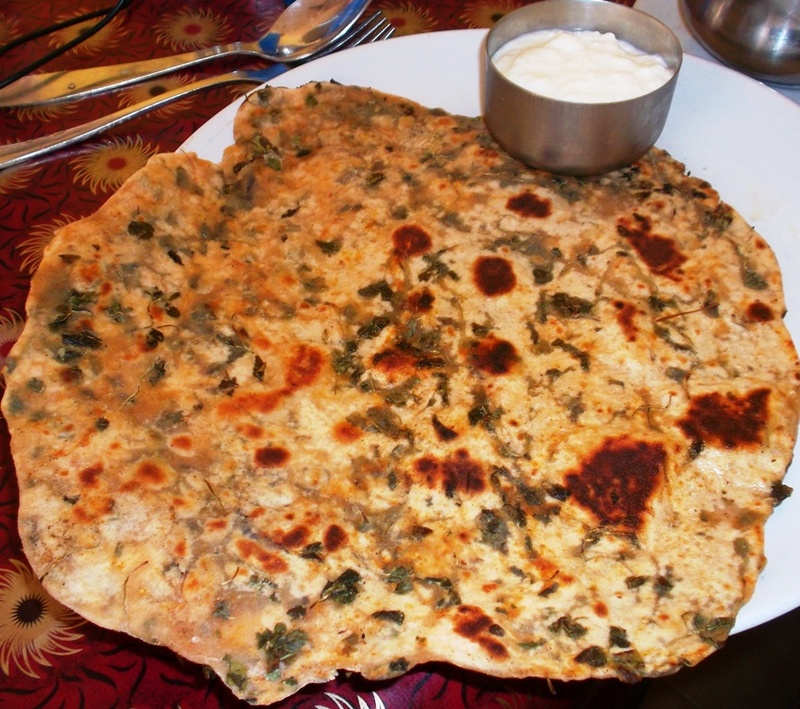 It’s an aloo or spinach parantha from a restaurant on Calangute beach in Goa. 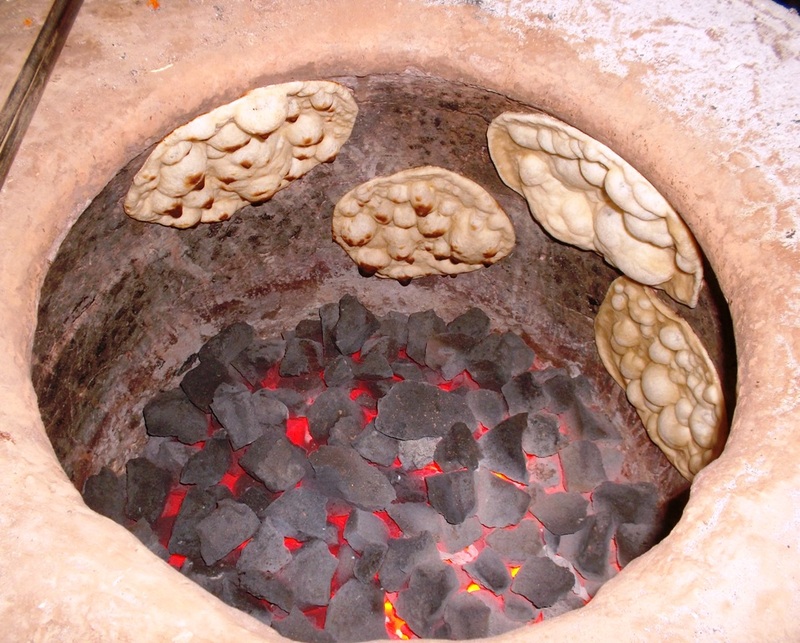 Indian food culture stems from centuries of history and cultural melting. There’s great variety. Many travelers don’t get stomach problems from food, especially those who stick exclusively to veg. During most of this calendar year, I was drifting through South America. There I ate street food on multiple occasions daily. I even had beef BBQ twice and chicken a few times. There were a bunch of occasions in Perú where I ate ceviche, or almost raw fish, on the streets. I never fell ill and I’ve put most if not all of my weight back on. While staying in a home in Colombia, I tried Fritanga, which in Colombia means liver, on arepa, or Colombian style all-corn tortilla. I did it only because my hosts were happy to turn me on to the local fare that they love. I ate anticuchos, or cow hearts, in Perú because it was my friend’s birthday. He chose a restaurant that serves nothing but the bovine organ. These two organ eating experiences reinforced the fact that I don’t like to eat the innards of mammals. I never have. While in Latin America, I learned that you can get enough veggies into your diet even in places where people power eat meat three times a day. That was demonstrated in the recent post: Peruvian Cuisine. I realized that the Mercado de Mariscos in Panama City might be the best place on earth to eat ceviche. Although ceviche originated in Perú, and is fresh and succulent there too, Panama City’s waterfront market offers the best I’ve ever tasted. 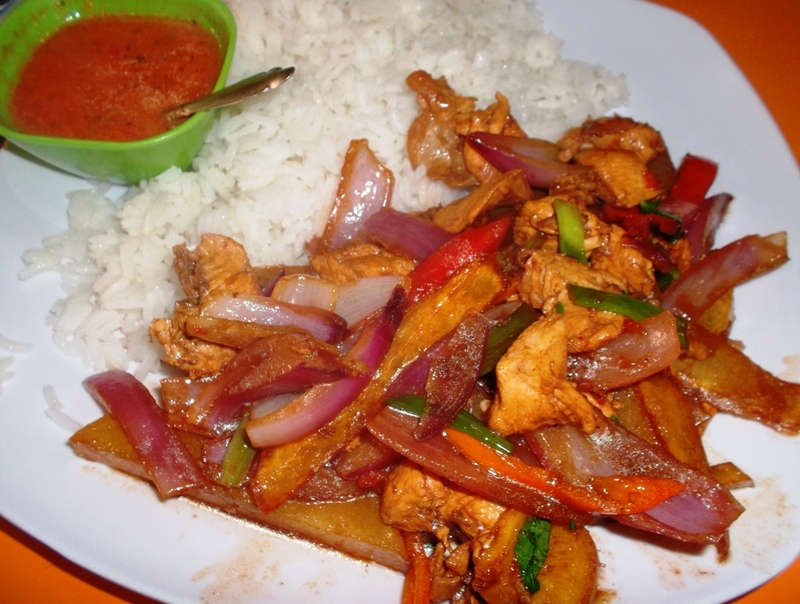 I’ve recently made Pollo Saltado and it was very tasty. I never actually learned this but just put it together after eating it and looking at the photo I took. In Central America, I consumed fried plantains twice a day. I’ve now experimented and made this tropical treat a few times myself. 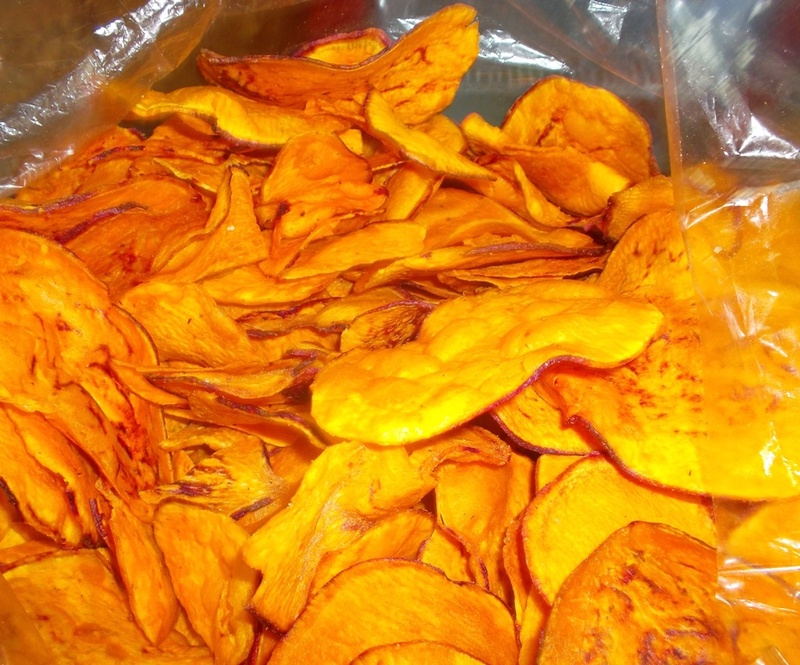 Just yesterday, I made fried sweet potato chips. The idea was spawned from my recent experience in Arequipa, Perú. Fried food isn’t the healthiest thing in the world but I wanted to try making these yummy snacks that I pleasantly discovered while drifting along an Arequipa street. Perhaps the number one thing that I’ve learned on these travels is: Be grateful for the ability to enjoy cosmopolitan cuisine with a healthy appetite. Don’t take for granted the ability to be hungry and enjoy food. Going forward, I hope to be able to continue to try new foods from around the world with a healthy stomach and digestive tract that remains open to sheer hedonistic, epicurean enjoyment. Have you developed food savvy from eating cosmopolitan cuisine? Feel free to leave a comment. I just read your latest post. You’re a soulful guy, thanks for sharing and enduring the travel. Sometimes its not all easy, but it surely helps to blossom your soul. Keep on drifting. I am back in the states and working. ESL doesnt always cut it, but in the right place it has its potential. Take care Brother. LUCAS: Blossoming the soul is a nice thing to consistently consider. When traveling, you don’t always have the comforts that most people have in the more developed world. It makes you realize that things like hot sink water and freshly painted walls are superfluous. Yes. The potential to enhance lifestyle through esl teaching varies greatly depending on where you decide to teach. 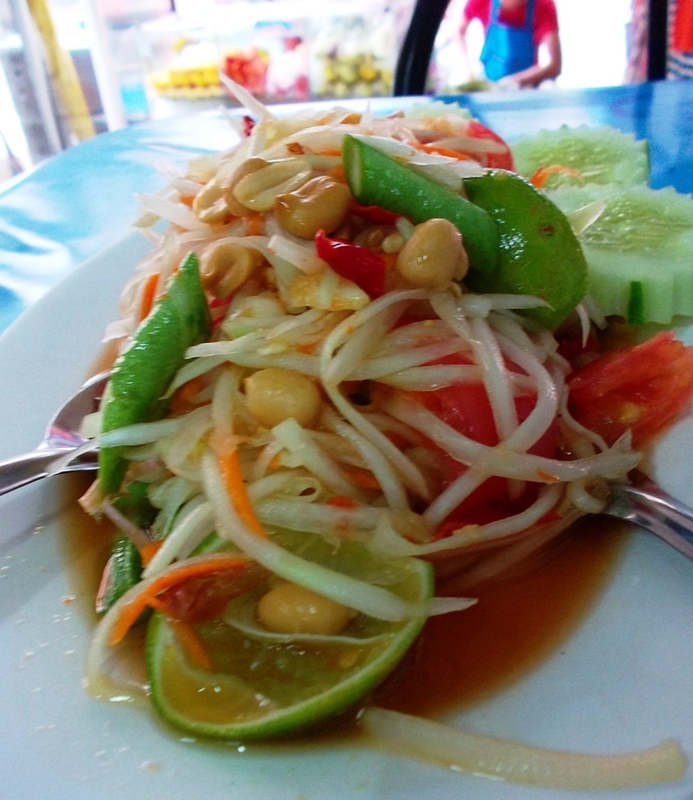 i *love* som tam… and naan… this post is making me hungry. ADIRONDACKER: I’m trying to eat a lot of salads, although they’re not quite the ultra tasty som tam. I like especially garlic naan. India is a bread connoisseur’s dream. SEANTONIO: He’s making chapati or roti. 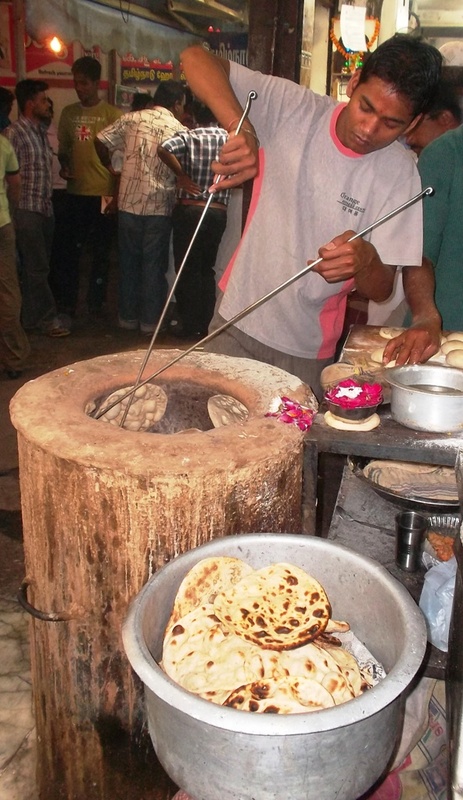 Upon arriving in India I called it roti, but within days chapati became a household name. That’s what they tend to call it where I went in India. It’s even more common than naan there. I love naan too and ordered it often. India is bread heaven. SARAH: Thanks! I need to try to not take for granted the traveling I’ve managed. Actually I’m very much in the mood to keep going. However, I’m hovering in remote FL while working on decisions. Maybe I’ll find an exotic place to teach ESL with the idea of exploring one place more indepth, while rejuvinating drifting funds. I’m still itching to do something beforehand. It’s still up in the air. Yes Som Tam is about as wildly flavorful as it gets. SE Asia is food paradise. PINKY: Thanks! I love it when I find those street stalls that I want to keep returning to. Great idea about learning how to say vegan. It works easier in touristy areas, off the gringo or falang trail it gets tougher. In the tropics I finally got used to eating fruit for as long as possible throughout the day. Fruit is supposed to be the single best thing to put into your body. Not so many gringos on Burma! You hit Burma at the perfect time. Now’s the time, would be a great land for me as I don’t know much about it. Looks super interesting.